Mogilev is not one of the most touristic places in Belarus, but it is definitely worth visiting if you come to our country. It is a very old city with a wide range of interesting attractions adn things to do. Find out why you should visit Mogilev. The first mention of Mogilev is dated by the year 1267. The chronicle says about the beginning of Mogilev castle construction at the river Dubrovenka and Dnieper crossing. There are several theories regarding the origins of the city's name. According to the first one, the city was named in honor of Prince Lev Danilovich Mogiya (mighty lion), according to the second version, it has got its name from another prince - Lev Vladimirovich from Polotsk. But, the exact reason is not found yet. Mogilev has always been a navigable city: Dnieper river divides it into two parts. The right bank rises above the river level. It offers a beautiful view of the Zadneprovsky part of the city, which was previously being flooded with water during high water, and now is completely built up. Frontier location of the city both helped in the development (due to active trade), and led to numerous attacks and destruction. Numerous monuments and memorials remind about hard times in the history of Mogilev. The most notable of them is the "Buinichi field". 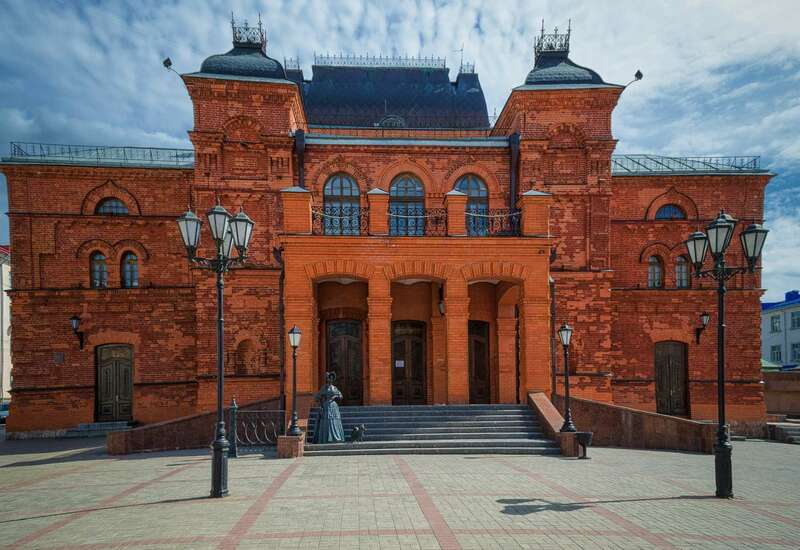 The first thing you notice is a 27-meter-high chapel painted in red (and inside decorated with a light marble), built in the East Slavic style. Here you can see plaques with the names of soldiers who sacrificed their lives defending the city. There are four walkways on the territory of the memorial, all of which meet near the chapel. Nearby is the Lake of Tears, which symbolizes the tears of mothers of dead soldiers. For architecture lovers will be interesting to visit the main city square - the Soviet square (former Trading square). A number of beautiful buildings built in the classical style were located on its perimeter including the governor's house, the district court and the house of the provincial administration. Only one building survived being an important sight of Mogilev. Now, there is a regional museum inside it. Another attraction is the City Hall, built back in 1578. During its existence, it has been repeatedly totally or partially destroyed, and only in 2008, it was opened again. Also of interest is the St. Nicholas convent, built in 1672. This architectural complex consists of stone buildings of Nicholas and Onufrij churches, two-storey house, and a bell tower. The historic city center is the pedestrian Lenin street with preserved buildings from XVIII-XIX centuries. Theater lovers will be surely attracted by the regional drama theater, which was opened in the late nineteenth century thanks to donations from the townspeople. Nowadays, theater art festivals are organized within its walls: Animaevka, Golden Hit, and others. A beautiful sculpture near the entrance to the theater is the famous "Lady with the Dog" of Anton Chekhov. Mogilev has a monument that has no analogs in the world. Astrologer monument with a telescope in his hand is situated on the City Star Square, the representative of a profession from King Arthur times. Twelve chairs are arranged around the monument, each of which is a symbol of a zodiac sign. You can also find a sundial on the square. Since 2013 a special stone for kisses was opened in the city, which is a favorite place of enamored travelers. We hope that you liked our article about the main attractions of Mogilev. Share it with your friends to open for them this wonderful city.